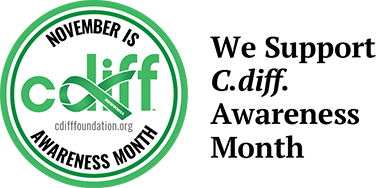 “The C Diff Foundation’s mission is to educate and advocate for C. difficile infection prevention, treatments, clinical trials, and environmental safety worldwide. SOME EXAMPLES OF CLINICAL TRIALS AVAILABLE ADDRESSING C.difficile INFECTION PREVENTION AND TREATMENTS. Visit clinicaltrials.gov for a full listing. The U.S. Food and Drug Administration (FDA) has granted a Breakthrough Therapy Designation for SYN-004 (ribaxamase) for the prevention of Clostridium difficile infection. At Pfizer, we apply science and our global resources to bring therapies to people that extend and significantly improve their lives. We strive to set the standard for quality, safety and value in the discovery, development and manufacture of healthcare products. Our global portfolio includes medicines and vaccines as well as many of the world’s best-known consumer healthcare products. Every day, Pfizer colleagues work across developed and emerging markets to advance wellness, prevention, treatments and cures that challenge the most feared diseases of our time. Consistent with our responsibility as one of the world’s premier innovative biopharmaceutical companies, we collaborate with health care providers, governments and local communities to support and expand access to reliable, affordable health care around the world. For more than 150 years, Pfizer has worked to make a difference for all who rely on us. For more information, please visit us at www.pfizer.com. In addition, to learn more, follow us on Twitter at @Pfizer and @Pfizer_News, LinkedIn, YouTube, and like us on Facebook at Facebook.com/Pfizer. DISCLOSURE NOTICE: The information contained in this release is as of January 26, 2017. Pfizer assumes no obligation to update forward-looking statements contained in this release as the result of new information or future events or developments. This release contains forward-looking information about a vaccine candidate, PF-06425090, including its potential benefits and the expected timing of commencement of a Phase 3 study, that involves substantial risks and uncertainties that could cause actual results to differ materially from those expressed or implied by such statements. Risks and uncertainties include, among other things, the uncertainties inherent in research and development, including the ability to meet anticipated clinical trial commencement and completion dates and regulatory submission dates, as well as the possibility of unfavorable clinical trial results, including unfavorable new clinical data and additional analyses of existing clinical data; risks associated with interim data; whether and when any biologics license applications may be filed for PF-06425090; whether and when any such applications may be approved by regulatory authorities, which will depend on the assessment by such regulatory authorities of the benefit-risk profile suggested by the totality of the efficacy and safety information submitted; decisions by regulatory authorities regarding labeling and other matters that could affect the availability or commercial potential of PF-06425090 and competitive developments. A further description of risks and uncertainties can be found in Pfizer’s Annual Report on Form 10-K for the fiscal year ended December 31, 2015 and in its subsequent reports on Form 10-Q, including in the sections thereof captioned “Risk Factors” and “Forward-Looking Information and Factors That May Affect Future Results,” as well as in its subsequent reports on Form 8-K, all of which are filed with the U.S. Securities and Exchange Commission and available at www.sec.gov (link is external) and www.pfizer.com. 3 U.S. Food and Drug Administration. Fast Track. http://www.fda.gov/ForPatients/Approvals/Fast/ucm405399.htm (link is external). Accessed January 2017. The Clover trial is evaluating an investigational vaccine that may help to prevent Clostridium difficile infection. Participants in the study are adults 50 years of age and older, who are at risk of developing Clostridium difficile infection. The study will assess whether the vaccine prevents the disease, and whether it is safe and well tolerated. — The following site is intended for use by United States residents only. If you are located outside of the United States, please refer to www.clinicaltrials.gov. Most C diff infections occur after antibiotic treatment. Why? Our gut contains trillions of microbes, called the microbiome, which protects us from bacterial invaders that can cause disease. Antibiotics kill both good and bad bacteria, leaving holes in this ecology (community) of microbes. When the microbiome is damaged, bad bacteria, like C diff, can take advantage and cause disease. Although specific antibiotics can kill the active C diff bacteria, the sleeping forms (ie, spores) are untouched. These spores turn into active C diff bacteria and cause disease again and again – usually after antibiotic treatment has finished. C. difficile infection (CDI). It’s a new antibiotic, and Summit is testing whether it can improve patient outcomes over the current standard of care, vancomycin, in two global clinical trials. In an earlier clinical trial in patients with CDI, ridinilazole was found to be superior to vancomycin in a measure called sustained clinical response, which tested if patients were cured after treatment and did not experience a recurrence within 30-days post-treatment. More information on ridinilazole can be found by visiting www.summitplc.com/our-programmes/c-difficile-infection. Further details of the global clinical trials can be found by visiting: https://clinicaltrials.gov/ct2/show/NCT03595566 and https://clinicaltrials.gov/ct2/show/NCT03595553, and/or by speaking with one of the clinical trial sites. The clinical trials will be taking place at sites in the US, Europe, Latin America, Australia and Asia. If you would like to be considered for enrollment into one of the clinical trials, please contact the study site nearest you. The PUNCH CD 3 study is a Phase 3 clinical study to evaluate the safety and efficacy of Rebiotix RBX2660 for the prevention of recurrent Clostridium difficile infection (CDI). This prospective, randomized, double-blinded, placebo-controlled clinical research study is expected to enroll up to 270 patients at 60 research sites in the U.S. and Canada. Patients that meet the study requirements and choose to enroll will be randomized to receive either RBX2660, an investigational new drug, or a placebo. Two out of every three study patients will receive RBX2660, and one out of every three study patients will receive the placebo study treatment (2:1 randomization). Study patients whose CDI returns within 8 weeks after blinded study treatment may be scheduled to receive an RBX2660 treatment (no placebo). The study’s primary endpoint will compare the proportion of patients with treatment success following treatment with RBX2660 to prevent recurrent CDI within 8 weeks of blinded treatment as compared to placebo. ZINPLAVA is a prescription medicine used to help decrease the risk of C-diff from coming back in people 18 years of age or older who are taking an antibiotic for C-diff and who have a high risk of C-diff coming back. C-diff is a bacterial infection that can damage your colon and cause stomach pain and severe diarrhea. Click here to learn more about PRISM 3 (https://www.prism3trial.com/trial) and see if there is a study near you and if you are eligible. DIFICID (fidaxomicin) is currently FDA approved to treat C. difficile-associated diarrhea (CDAD) in adult patients 18 years of age and older.